Our 3-star strategy for Angry Birds Seasons The Pig Days Level 6-17 is shown in the video below. The score is 231,250. 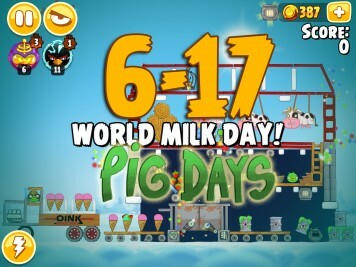 This Pig Days level celebrates World Milk Day!. 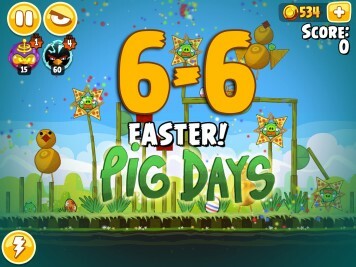 Our 3-star strategy for Angry Birds Seasons The Pig Days Level 6-16 is shown in the video below. The score is 109,600. 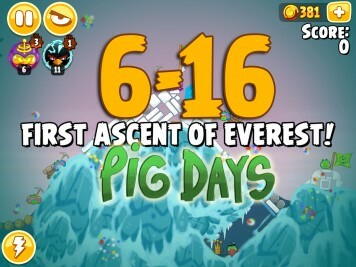 This Pig Days level celebrates First Ascent Of Everest!. Our 3-star strategy for Angry Birds Seasons The Pig Days Level 6-15 is shown in the video below. The score is 167,140. 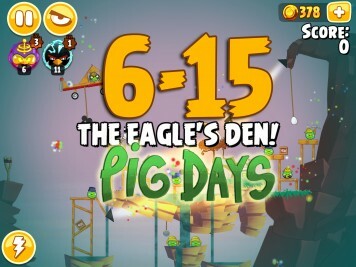 This Pig Days level celebrates The Eagle's Den!. 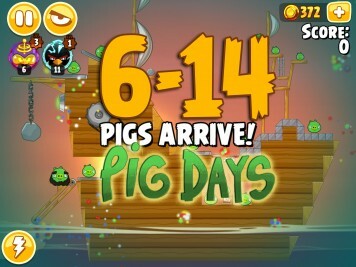 Our 3-star strategy for Angry Birds Seasons The Pig Days Level 6-14 is shown in the video below. The score is 198,730. This Pig Days level celebrates Pigs Arrive!. Our 3-star strategy for Angry Birds Seasons The Pig Days Level 6-13 is shown in the video below. The score is 154,760. 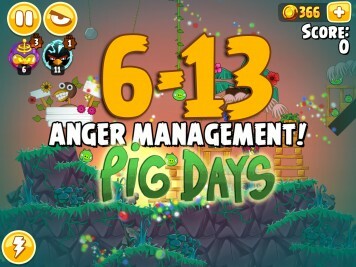 This Pig Days level celebrates Anger Management!. Our 3-star strategy for Angry Birds Seasons The Pig Days Level 6-12 is shown in the video below. The score is 122,570. 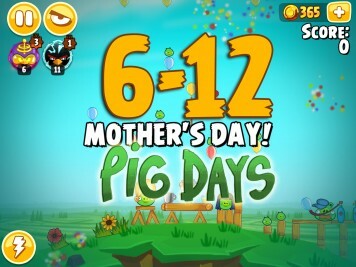 This Pig Days level celebrates Mother's Day!. Our 3-star strategy for Angry Birds Seasons The Pig Days Level 6-11 is shown in the video below. The score is 87,170. 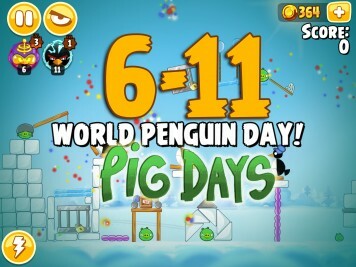 This Pig Days level celebrates World Penguin Day! Our 3-star strategy for Angry Birds Seasons The Pig Days Level 6-10 is shown in the video below. The score is 160,290. 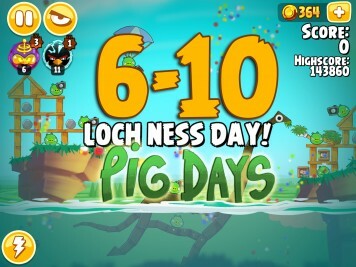 This Pig Days level celebrates Loch Ness Day. Our 3-star strategy for Angry Birds Seasons The Pig Days Level 6-9 is shown in the video below. The score is 165,290. 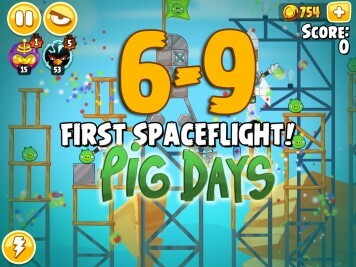 This Pig Days level celebrates the First Spaceflight anniversary. Our 3-star strategy for Angry Birds Seasons The Pig Days Level 6-8 is shown in the video below. The score is 140,400. 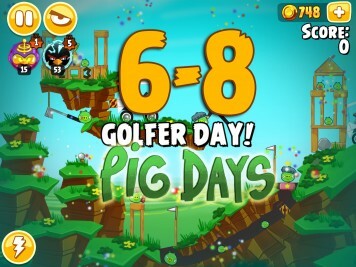 This Pig Days level celebrates Golfer Day! Our 3-star strategy for Angry Birds Seasons The Pig Days Level 6-7 is shown in the video below. The score is 172,560. 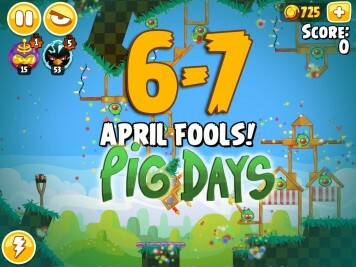 This Pig Days level celebrates April Fools! Happy Easter! Our 3-star strategy for Angry Birds Seasons The Pig Days Level 6-6 is shown in the video below. The score is 150,100. This Pig Days level celebrates Easter! Our 3-star strategy for Angry Birds Seasons The Pig Days Level 6-5 is shown in the video below. The score is 256,630. 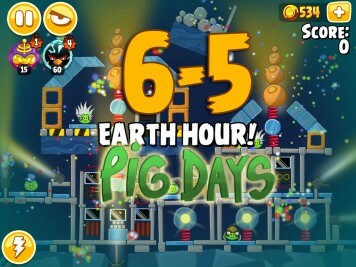 This Pig Days level celebrates Earth Hour!